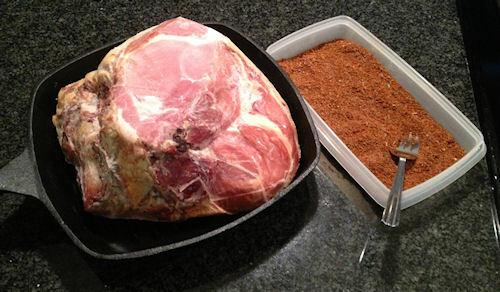 The Ham Roast and Dry Rub. At the bottom of this post you will find detailed info on the ham roast, the rub ingredients and other helpful hints. Here is a quick overview of the process. It’s a work in progress, so feel free to make changes to fit your taste. Leave the roast in the fridge overnight. If you want to, you can rub some evoo on it and coat it in the dry rub, but I generally just take it out of the freezer and put it in the fridge to defrost over night and apply the dry rub in the morning. 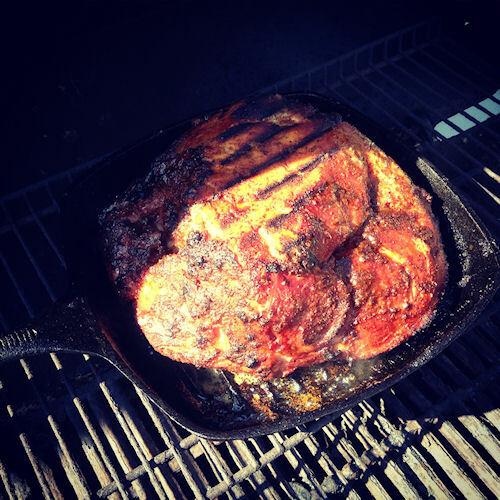 8am – (Or so) begin heating the grill… Mix dry rub together and open ham roast. Rub evoo on roast and place in cast iron skillet. Coat with dry rub. I usually use about half of the rub on the roast and save half for other parts of the process. 8:20 – Place it on the grill. I close the lid and let it get all tasty smelling. After about :20 mins I flip it and let it brown on the other side. 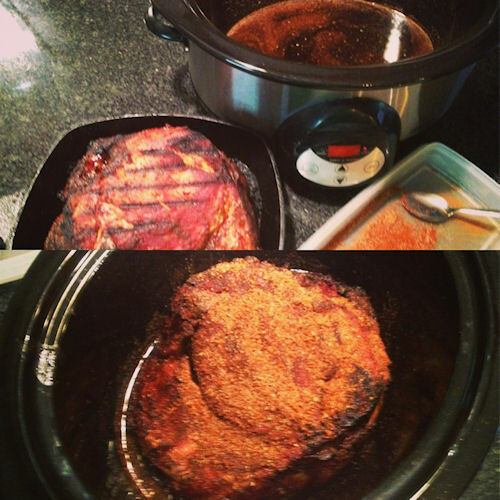 8:30 – While the ham roast is prepping on the grill I get the slow cooker ready. I add a few spoonfulls of the dry rub to a can of chicken broth and a pour of sweet rice wine, splash in a few drops of balsamic vinegar and add soy sauce. Turn slow cooker on high. The only ingredients I measure here are the chicken broth and dry rub… I’ve given you a general idea of the amounts of the other ingredients… There needs to be some finesse to cooking, right? Placing the Roast in the pot! 1-2ish. Check the pot. If the meat all falls away with a fork, go ahead and pull it apart. If not, let it sit a little more. I never use a knife to cube it… When it’s ready it will fall apart. 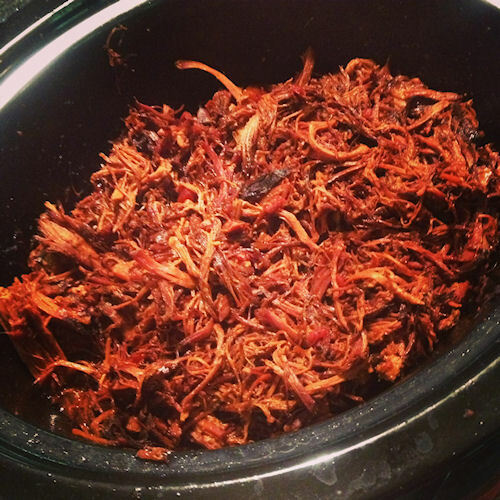 After meat falls apart with gentle prodding from a fork, turn the slow cooker to low. Stir it once, let it sit. 4-5pm open a can of petite cut tomatoes (with onion) – or a can of green chilies – drain a little of the juice and dump them in. Let it simmer for another hour or so. -3 1/2 lb pork shoulder or roast. -Bone in is fine. It will fall off the bone. -EVOO to rub on roast.